This document describes the process QDR uses to convert MS Word or PDF comments into Transparency Appendix (TRAX) documents. At the end of the process, QDR produces two documents: 1) the annotations in human-readable form and 2) the same annotations in the machine-readable XFDF format (pdf), which allows annotations to be re-imported into a PDF. The goal of this document is to make the TRAX process transparent and to allow interested users to replicate it. The process is subject to change as better formats and/or conversion tools become available. If you annotated in MS Word, you need to export your final document file to PDF format. Please do not use “print to PDF.” While this keeps comments visible in the PDF, they are not accessible and usable via the note function of your PDF reader. Instead, “export to PDF” using Acrobat’s native PDFMaker, which is accessible from inside MS Word via the ACROBAT tab. You must select the option to convert MS Word comments to PDF notes, which is available as an option via the Preferences button. Whether you annotated in MS Word and exported to PDF or added comments directly into a PDF document, your annotations are now in the form of a PDF document with comments. These comments now need to be extracted for the TRAX. 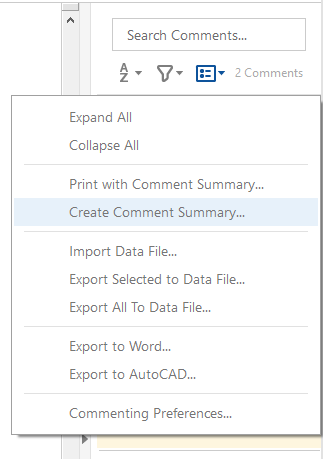 From the PDF document with comments, you will perform two separate exports. The first will export all comments to a new PDF file, the second will export all comments as data that can be re-imported by other users. QDR will host both files. 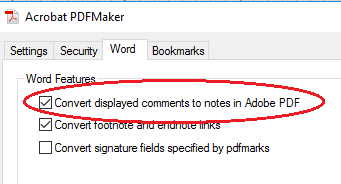 For exporting a PDF, in Acrobat’s comment tab, select “Create Comment Summary” and then “Comments only,” “All comments,” and uncheck “Pages containing no comments.” Save as as <author>_TRAX.pdf. For exporting the data, click on “Export All to Data File” and save to .xfdf format as as <author>_TRAX_data.xfdf.